Being January, most people really don’t want to hear about or see sweets. As much as I’m protesting making and sharing healthier dishes, I will at least hold off on making and sharing any desserts for a while. Well, maybe just this week. I’ve been really wanting some cookies or chocolate lately and I still need to find the perfect brownie recipe. I’m on a quest to find the right fudgy recipe this year. In the meantime, I needed and wanted to come up with something else new to make this week. 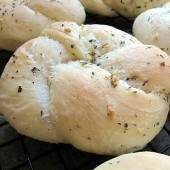 After much searching through my bookmarked recipes, I decided on Annie’s garlic knots. It’s a pretty quick dough to whip up but does require regular rising time, so plan for several hours – most of which is down time. The dough itself is beyond easy to work with. I was very impressed with how well it rolled. I had to make a slight change along the way because I didn’t have Italian seasoning for topping, but what I put together worked out perfect. When I first tasted the rolls I was expecting a stronger garlic taste. 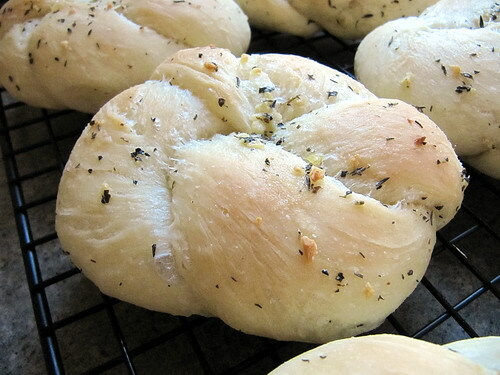 Now that can easily be remedied by simply making sure more of the garlic gets on to each roll or even a slight sprinkling of garlic salt prior to baking. Though after consideration, the flavoring is just right. Everything works really well together. The best part of these rolls are how incredibly soft and fluffy they are. 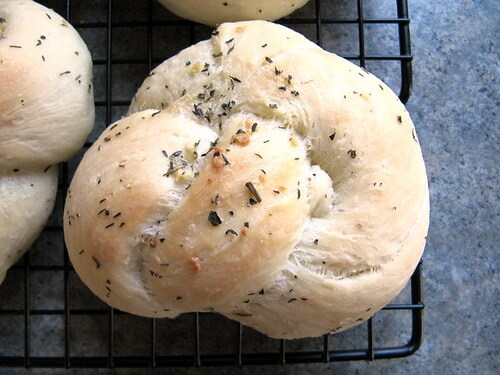 I’ve never had a homemade roll that was this tasty. I mean it. I think these might be my new go to dinner roll. They’re simple, delicious and even the kids give them a big thumbs up. I have to say, these are the first rolls I’ve ever eaten without butter. Amazing all by themselves. In the bowl of a stand mixer (or large bowl), combine dry ingredients for the dough. Start with only 3 cups of bread flour, reserving more for later if necessary. With the mixer set on low, begin adding the wet ingredients to the dry. Continue mixing until a nice ball forms that isn't too sticky. Mine was still sticking to the bottom and sides of the bowl at bit with just 3 cups of flour so I began adding slightly more until a ball had formed. 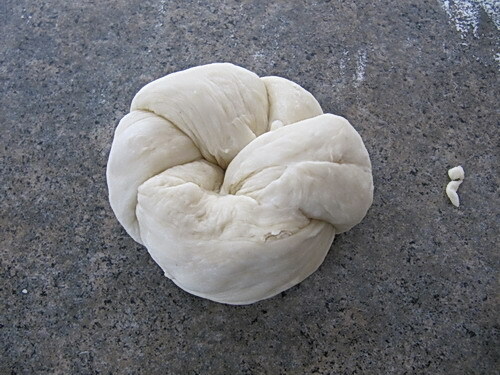 I ended up using just under 3 1/4 cups of bread flour for this dough, but as with most doughs that could change depending on the weather so play it by ear. Spray a large bowl with olive oil or your favorite baking spray. Toss dough into the bowl and flip so all sides of the dough are coated. Cover the bowl tightly with plastic wrap. Let rise in a warm location for an hour or until doubled in size. Prep a baking sheet with a silpat or sheet or parchment paper, set aside. 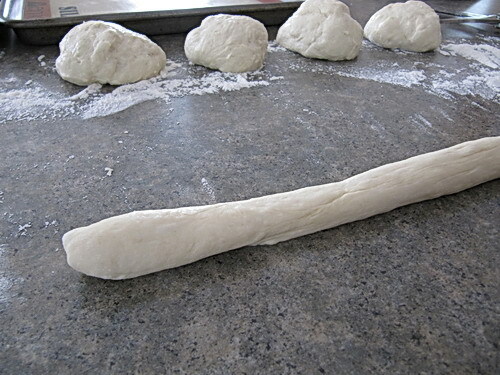 Using clean kitchen shears, cut dough into ten equal portions. I opted for cutting the dough in half and then down from there. Trim larger pieces and distribute extra as necessary to make the portions as similar in size as possible. Grease hands well with olive oil prior to rolling out each portion of dough. 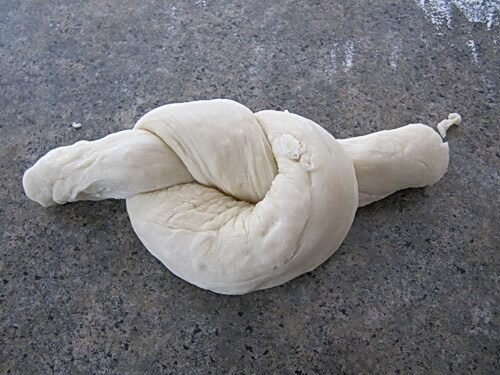 Starting with one piece of dough, roll a long rope or snake - roughly 10 inches long or so. Tie into a knot. Take the under tail and fold into the center of the top. Take the remaining piece that is hanging over the top and fold that down into the center of the bottom. Transfer to your prepared baking sheet. 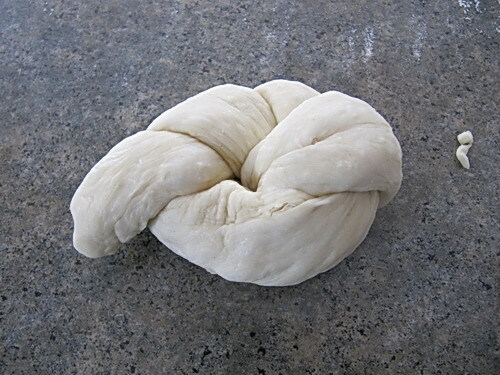 Continue process with remaining portions of dough. Cover with a clean kitchen towel and let rise for 45 minutes or until puffy. Preheat oven to 350 degrees. In a small bowl add freshly minced garlic, 3 tbsp butter and seasonings. Pop in the microwave for 30-45 seconds or until butter is fully melted. I perfer this method because it helps slightly infuse the butter with the garlic flavor. Brush seasoned butter over the top and sides of each roll. Bake for 15-20 minutes or until just slightly golden. They will be extremely soft to the touch. Do not overcook. Transfer to a cooling rack to cool completely. Feel free to eat the extras that don't fit on one cooling rack, you'll want to. Serve warm or store in an airtight container for several days.